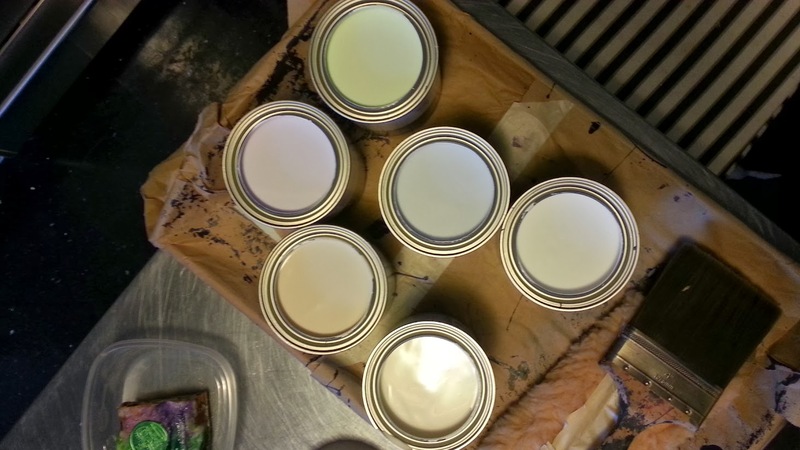 The technique starts with six quarts of paint. You daub the paint on with a sopping brush in big, thick strokes. It's a careless, untidy process, super forgiving and easy to do. 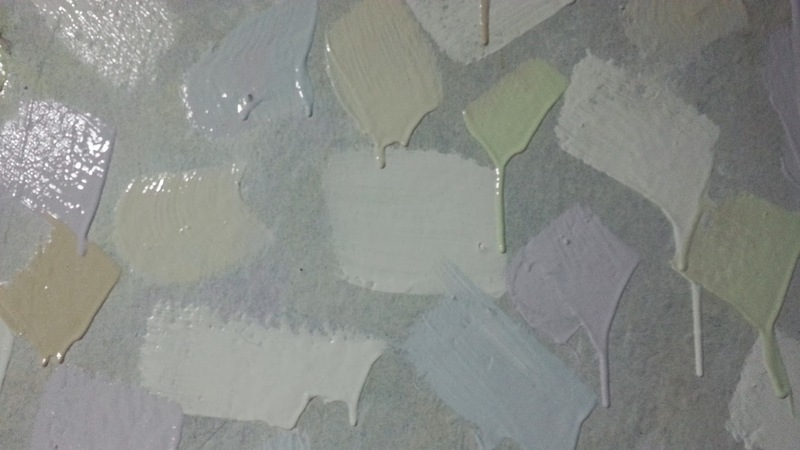 You can play around with color proportions: here, pure white gets the most brushfuls, beige gets the fewest. Could use a little more smudging to obliterate the brushstrokes and the drips better. I think I like the result. 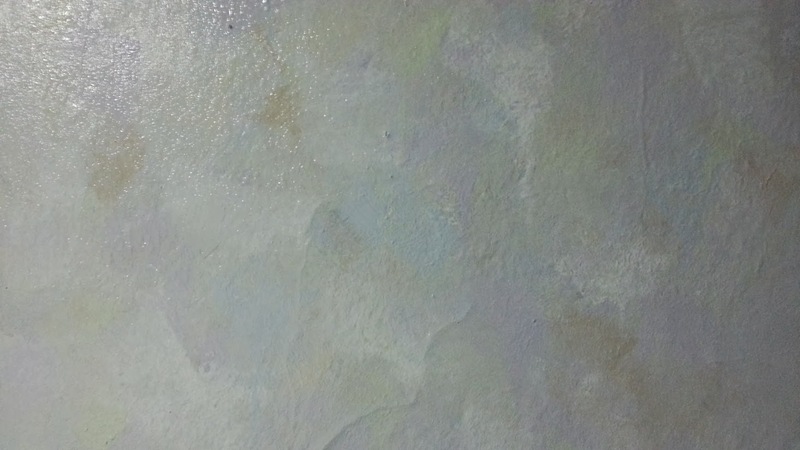 I'll know more in the morning light when the paint is completely dry. Ooooo! That looks like *fun*! I absolutely hate painting, but this technique actually is fun. I would love to take credit for this technique, but it's not original with me. Someone more adventurous than I am figured it out. That looks gorgeous. It looks like just the way an artist layers up colour in a painting (I surmise, I'm not artist). And those colours look beautiful together. That's pretty much what my brother the artist said. The result reads as more-or-less white (in my living room, more-or-less black) but the subtlety of the effect is really pleasing. I like that! I was idly thinking about sponging the walls in my office, but I might do this instead. I recommend this over sponging because it's just so much faster and easier. You have to be assiduous about masking and draping, but the actual painting goes super-fast, and covers almost anything in a single pass. (The exception is in the pictures above, where I tried to cover dark purple with near-white--definitely some primer needed in that case). Cleanup is one brush and one lambswool pad. Thanks! I saved the video. However, I have wallpaper on everything because the walls are covered with perfectly dreadful paneling that resists nails, drilling, and normal paint--you can get a sheer cover with LOTS of floor enamel, otherwise nope. Yikes! That sounds pretty limiting. Ah, the joys of older homes. Oddly, the experimental Kryptonite paneling does not seem to have been sold outside Jersey City.